Background: The purpose of this study is to determine the effectiveness of warming anesthesia on the control of the pain produced during the administration of dental anesthesia injection and to analyze the role of Transient Receptor Potential Vanilloid-1 nociceptor channels in this effect. Patients and methods: A double-blind, split-mouth randomized clinical trial was designed. Seventy-two volunteer students (22.1±2.45 years old; 51 men) from the School of Dentistry at the Universidad Austral de Chile (Valdivia, Chile) participated. They were each administered 0.9 mL of lidocaine HCl 2% with epinephrine 1:100,000 (Alphacaine®) using two injections in the buccal vestibule at the level of the upper lateral incisor teeth. Anesthesia was administered in a hemiarch at 42°C (107.6°F) and after 1 week, anesthesia was administered by randomized sequence on the contralateral side at room temperature (21°C–69.8°F) at a standardized speed. The intensity of pain perceived during the injection was compared using a 100 mm visual analog scale (VAS; Wilcoxon test p<0.05). Results: The use of anesthesia at room temperature produced an average VAS for pain of 35.3±16.71 mm and anesthesia at 42°C produced VAS for pain of 15±14.67 mm (p<0.001). Conclusion: The use of anesthesia at 42°C significantly reduced the pain during the injection of anesthesia compared to its use at room temperature during maxillary injections. The physiological mechanism of the temperature on pain reduction could be due to a synergic action on the permeabilization of the Transient Receptor Potential Vanilloid-1 channels, allowing the passage of anesthetic inside the nociceptors. The methods studied to control this situation include the use of nerve block injections, lower injection speeds at 1 cartridge/min4,5 and the compression of tissues adjacent to the puncture site.5 However, all these methods are operator-dependent. One method proven to reduce the perception of pain is to warm local anesthetics.6–8 Reports in dentistry are inconsistent. Rogers et al9 showed that the warmed anesthetic injection was significantly more comfortable than one at room temperature. However, Oikarinen et al10 and Ram et al11 showed that the injection of anesthetic at body temperature did not present any significant differences in the subjective perception of pain. Therefore, the aim of this study is to determine the effectiveness of the use of anesthesia at 42°C in the perception of pain during the administration of dental anesthesia compared to its use at room temperature (21°C) during the maxillary injection technique. In addition, the physiological role of the nociceptor membrane channels will be analyzed in terms of the effect of warming the anesthetic on reducing the perception of pain. A double-blind, split-mouth randomized clinical trial was conducted according to Consolidated Standards of Reporting Trials (CONSORT) guidelines and was reviewed and approved by the Ethics and Research Committee of the Valdivia Health Service, Government of Chile (no. 075/2015). The study is registered under clinical study # ISRCTN78906795. Students from the School of Dentistry at the Universidad Austral de Chile, Valdivia, Chile participated. The students selected had American Society of Anesthesiologists I health status, were aged between 18 and 35 years, were of both genders, and had not undergone any treatment with nonsteroidal anti-inflammatory drugs in the 2 months prior to the study and were without dental pain or infection at the puncture site. Before starting the study protocol, all participants provided written informed consent approved by the ethical committee. The sample size was based on a pilot study15 who showed a mean difference of 18.5 points on the visual analog scale (VAS) using local anesthetic at 42°C. Considering a 5% level of significance, a study power of 90% and including 25% of the sample in case of loss of observers, a total of 70 subjects were estimated. To warm the anesthesia, a researcher (CB) undertook a pilot study with 20 cartridges of anesthesia. A baby bottle warmer was used (Phillips Avent®, Amsterdam, the Netherlands) similar to that used in previous reports.6,11,12 The cartridge of anesthetic was left in a hermetically sealed plastic bag that was placed in the warmer containing 300 mL of cold water (21°C). Using the maximum power of the apparatus, the anesthetic fluid reached 42°C (107.6°F) in 3 min 50 seconds. To determine the chronological order of injection with the anesthesia warmed to 42°C, a simple randomization function of the program MS Excel 2013 (Microsoft Corporation, Redmond, WA, USA) was used. The first injection was applied on the subject’s dominant side (left/right) and the temperature used depended on the random number (even=room temperature; odd=42°C) with the participant blinded to it. For anesthetic infiltration to the anterosuperior alveolar nerve, a researcher (CT) with more than 10 years of experience in dental anesthetic techniques administered the anesthetic according to the steps and technique described by Malamed.4 The injection point was placed in the mucobuccal fold apically between teeth #6 and #11 using a 30G short needle (Septoject XL; Septodont, Saint-Maur-des-Fossés, France) and injecting 0.9 mL of the anesthetic (Alphacaine100®; Nova DFL, Taquara Rio de Janeiro, Brazil) at a speed of 0.15 mL/second.16 Immediately after the injection, a second researcher presented the patient with a 100 mm VAS (0=absence of pain; 100=unbearable pain) asking “How much pain did you feel as the anesthesia was being administered?”. The pain indicated with a finger or verbally was recorded. There was a 1-week washout period after the first injection and the second injection was administered on the contralateral side of the maxilla with the other anesthetic temperature according to the described random sequence. The temperature used (42°C and room temperature) was the independent variable and the dependent variable was the level of pain perceived during the anesthetic injection. To verify the effectiveness of warming the anesthetic to 42°C vs. room temperature (21°C), the parametric behavior of the pain records in both study groups was analyzed by a third blinded researcher (PCA) using the Shapiro–Wilk test. Then, the median, SD (±) and 95% CIs of the VAS of all the subjects in both study groups were compared using the corresponding test according to the distribution of the values (Student’s t-test or Wilcoxon test; p<0.05) using STATA v10.0 (StataCorp LP, College Station, TX, USA). In total, 83 volunteer students participated between July and September 2015. Based on the criteria for selection and after the 1-week washout period, 11 students were excluded (Figure 1). Finally, 72 subjects (51 men) were analyzed, who had an average age of 22.1±2.45 years (range 18–29 years; men: 21.9±2.3 years, women: 22.3±2.6 years). Figure 1 CONSORT flow diagram. Note: The subjects participated in both study groups (split mouth) with a 1-week washout. Abbreviation: CONSORT, Consolidated Standards of Reporting Trials. The distribution of normality of the pain records in the two groups was found to be nonparametric (p=0.001). The level of pain perceived according to the VAS by the 42°C group was significantly lesser that that of the room temperature group (p<0.001; Table 1). According to the hypothesis raised here, it was verified that the use of anesthesia at 42°C significantly reduced pain compared to that at room temperature during the injection of local anesthesia using the maxillary infiltration technique. Our results are consistent with previous reports on the effect of warming the anesthesia on the perception of the pain in the trigeminal territory: using 2% procaine 1:80,000 epinephrine (Palex Medical Laboratories, Madrid, Spain) at 43°C in plastic surgery;6 1% lidocaine 1:200,000 epinephrine (Astra Laboratories, Cambridge, UK) at 38°C in cheek or face anesthesia17 and 2% lidocaine (Astra Laboratories) with 5 mL 0.5% bupivacaine at 37°C in cataract surgery.18 In dentistry, special attention is paid to this issue, considering that most dental procedures require local anesthesia. Rogers et al9 showed that the use of anesthesia at body temperature was more comfortable than at room temperature. Nevertheless, other reports10,11 have not demonstrated a positive effect and their methodology does not permit comparison with our results, mainly due to the lack of data on the method of warming of the anesthetic and to the use of scales for facial expression, movements of extremities or perceived crying.11 On the other hand, there are studies that even suggest not warming the anesthetic cartridges because the drug and the vasoconstrictor inside could degrade, which would decrease its effectiveness.4,19 Although the manufacturer’s instructions encourage keeping the cartridges at room temperature, there are reports that show that lidocaine can tolerate repeated sterilization by autoclave20 and that epinephrine can withstand repeated warming with no appreciable degradation,21 even at extreme temperatures of up to 51.7°C for an accumulated time of 13.25 hours.22 However, this information is inconclusive in dentistry given the paucity of technical reports based on electronic data that can verify the preservation of anesthetic compounds inside the cartridge at different temperatures. The limitations of our study are related to patient–dentist variables. It must be considered that the subjects were healthy volunteers who do not necessarily represent the population that requires local anesthesia. In addition, the description of the subjective variable as pain using a VAS is dependent on the emotional state and previous history of the subjects to the perception of pain and the injection of anesthetics. However, this is recognized as a valid and reliable method in clinical use.29 The control of the speed and anesthetic technique varies according to the dentist’s experience, the reason for the anesthesia and the anatomy of the puncture site, a situation which generates different levels of pain perception conditioned mainly by the patient’s previous experience with dental treatment.13,14 In any case, it is advisable to inject the anesthetic slowly4,16 since it has been proven that the sensitivity of the nociceptors not only depends on the type of chemical agent but also on the mechanical effects of the injection site and the speed and volume of the injection.2 Despite these limitations, we have controlled the possible risks of bias set out by Hogan et al,12 such as adequate generation of the intervention sequence, masking of the participants and analysis of results. In conclusion, warming the anesthetic cartridges to 42°C demonstrated a reduction in pain during the injection of anesthesia in the maxillary infiltration technique compared to the anesthesia used at room temperature. These results contribute to the need to use an easy and replicable method that can control pain during dental injection, so as to reduce pain and anxiety levels during dental treatment using domestic portable equipment such as incubators with a thermostat or baby bottle warmer. It is suggested that there should be future analyses of patients with pulpal pathologies and discussion based on the physiological and pharmacologic foundations that can explain this clinical result. van Wijk AJ, Hoogstraten J. Anxiety and pain during dental injections. J Dent. 2009;37(9):700–704. Wang W. Tolerability of hypertonic injectables. Int J Pharm. 2015; 490(1–2):308–315. Levine J, Taiwo Y. Inflammatory pain. In: Wall PD, Mezlack R, editors. Textbook of Pain. 3rd ed. Edinburgh: Churchill Livingstone; 1994. Malamed SF. Handbook of Local Anesthesia. 6th Ed. St. Louis: Elsevier Health Sciences; 2014. Park KK. Minimize that “pinch and burn”: tips and tricks to reduce injection pain with local anesthetics. Cutis. 2015;95(6):E28–E29. Oikarinen VJ, Ylipaavalniemi P, Evers H. Pain and temperature sensations related to local analgesia. Int J Oral Surg. 1975;4(4):151–156. Ram D, Hermida LB, Peretz B. A comparison of warmed and room-temperature anesthetic for local anesthesia in children. Pediatr Dent. 2002;24(4):333–336. Hogan ME, vanderVaart S, Perampaladas K, Machado M, Einarson TR, Taddio A. 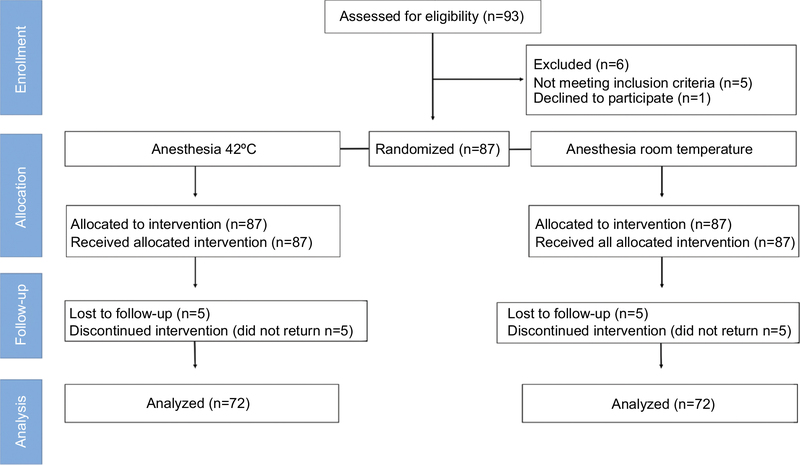 Systematic review and meta-analysis of the effect of warming local anesthetics on injection pain. Ann Emerg Med. 2011;58(1):86–98.e1. Erten H, Akarslan ZZ, Bodrumlu E. Dental fear and anxiety levels of patients attending a dental clinic. Quintessence Int. 2006;37:304–10. Prathima V, Anjum MS, Reddy PP, Jayakumar A, Mounica M. Assessment of anxiety related to dental treatments among patients attending dental clinics and hospitals in Ranga Reddy District, Andhra Pradesh, India. Oral Health Prev Dent. 2014;12(4):357–364. Aravena PC, Barrientos C, Troncoso C. Effect of warming anesthetic solutions on pain during dental injection. A randomized clinical trial. J Oral Res. 2015;4:306–312. Waldbillig DK, Quinn JV, Stiell IG, Wells GA. Randomized double-blind controlled trial comparing room-temperature and heated lidocaine for digital nerve block. Ann Emerg Med. 1995;26(6):677–681. Bainbridge LC. Comparison of room temperature and body temperature local anesthetic solutions. Br J Plast Surg. 1991;44(2):147–148. Ursell PG, Spalton DJ. The effect of solution temperature on the pain of peribulbar anesthesia. Ophthalmology. 1996;103(5):839–841. Reed KL, Malamed SF, Fonner AM. Local anesthesia part 2: technical considerations. Anesth Prog. 2012;59(3):127–137. Brunton LL, Lazo JS, Parker KL. Goodman & Gilman’s The Pharmacological Basis of Therapeutics. 12th ed. New York: McGraw-Hill; 2012. Grant TA, Carroll RG, Church WH, et al. Environmental temperature variations cause degradations in epinephrine concentration and biological activity. Am J Emerg Med. 1994;12(3):319–322. Gill MA, Kislik AZ, Gore L, Chandna A. Stability of advanced life support drugs in the field. Am J Health Syst Pharm. 2004;61(6):597–602. Guo A, Vulchanova L, Wang J, Li X, Elde R. Immunocytochemical localization of the vanilloid receptor 1 (VR1): relationship to neuropeptides, the P2X3 purinoceptor and IB4 binding sites. Eur J Neurosci 1999;11(3):946–958. Chung MK, Güler AD, Caterina MJ. TRPV1 shows dynamic ionic selectivity during agonist stimulation. Nat Neurosci. 2008;11(5):555–564. Binshtok AM, Gerner P, Oh SB, et al. Coapplication of lidocaine and the permanently charged sodium channel blocker QX-314 produces a long-lasting nociceptive blockade in rodents. Anesthesiology. 2009;111(1):127–137. Stueber T, Eberhardt MJ, Hadamitzky C, et al. Quaternary Lidocaine Derivative QX-314 activates and permeates human TRPV1 and TRPA1 to produce inhibition of sodium channels and cytotoxicity. Anesthesiology. 2016;124(5):1153–1165. Kjeldsen HB, Klausen TW, Rosenberg J. Preferred presentation of the visual analog scale for measurement of postoperative pain. Pain Pract. Epub 2015 Aug 27.